The modified biogas digester in Namawanga, Kenya. When a systems engineering Ph.D. candidate at the University of Virginia and an engineer were looking for a sustainable biogas fuel system to replace wood fuel for cooking in the village of Namawanga, Kenya, they found that the community's dairy project produced the perfect source: cow dung. Student, Justin Henriques and William Schnorr, an engineer at 2rw Consultants, partnered with Possibilities Africa, an agency that had had a community dairy project in Namawanga for about three or four years, to develop an alternative fueling mechanism for the village of 15,000. "We thought it would be a good coupling of the two objectives," said Henriques, explaining that the dairy project's goal is to provide each family with a milk-producing cow. The engineering team had found their fuel and now needed to determine what type of technology would be used to produce the biogas and how it was going to be implemented. Table 1. Eight Capacity Factors and Their Definitions. Click to enlarge (PDF). Henriques and Schnorr decided that a biogas digester would be the most viable technology because it was easy to operate and maintain. They used Capacity Factor Analysis (CFA), a quantitative decision model to determine what factors needed to be addressed in the village in order for biogas to become a good alternative household fuel. 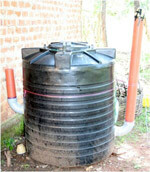 CFA was originally developed for determining drinking water and sanitation technologies in developing communities. CFA uses eight categories (Table 1), called capacity factors, to evaluate a community's ability to manage water and sanitation technologies. The model then rates technologies based on what is needed for their management in each capacity factor. Fig. 1. Community capacity to manage technology and management demands of technology. "These categories range from the triple bottom line of sustainability to more traditional design criteria to inform the selection of the technology and how we were going to design it," said Henriques, explaining that the CFA model was used to identify the categories that could lead to system failure. For example, if the technical — defined as supply chain, spare parts, supplies, and services — capacity factor ranks low, then a local supply chain must be established to ensure that the village can replace a spare part easily. The students collaborated with community decision makers to determine low, medium, and high capacity in each CFA category. Furthermore, LOTI, or Least of These International—which was founded by Henriques—an implementing developing agency, rated the biogas technology as needing high, medium, or low management capability in each category. The values were plotted on a radar graph (Fig. 1), which identified human resources and technical CFAs as the two factors that would limit the sustainability of the biogas digester. Several days of informal training were held on system management, operation, and maintenance. Traditional biogas digesters are commonly constructed with brick or concrete, requiring a skilled professional to properly shape the chamber to make it airtight. To circumvent the need for a mason, the team used a prefabricated water tank for the digester chamber. The modified fixed dome biogas digester (MFDBD) not only simplified construction, but it minimized the cost as well — about $200 for materials and labor. Resolving the human resource component was critical to the success of the biogas digester because past projects had failed due to a lack of maintenance. Several days of informal training were held on system management, operation, and maintenance. Because of the communal nature of the village, everyone in the community participated in the training sessions. "We did a series of hands-on learning and teaching sessions for a couple of local schools where they would get their hands dirty and put the pieces of the biogas digester together, so they would have a sense of what's going on with the technology," said Henriques. A more formal program will start in June, when villagers can become certified in biogas digester maintenance. "There's something about certification that really gives people a sense of empowerment," said Henriques. "They have knowledge of something that somebody else has validated." Within two weeks of installation, the pilot biogas digester began producing 0.20 cubic meters of fuel per day, enough to cook breakfast for a family of five. Annually, the biogas digester should produce 73 cubic meters of gas, providing 423,000 kilocalories of heat. To prevent the buildup of scum on the top layer of the slurry, the team installed a stirring mechanism consisting of a 30-foot manila cloth rope attached to a plastic bottle filled with rocks. Villagers could pull the rope side to side, creating a current in the tank and preventing scum buildup. Two to four weeks after the biogas digester was installed, it began producing .2 cubic meters of fuel per day. "The system is a success because, while there are plenty of areas for technical improvement, it hasn't failed in the ways that biogas systems often fail — with respect to operation and maintenance," said Henriques, explaining that the success of the digester can be attributed to using CFA to determine and help resolve areas that would have led to failure. Now that the digester is running, Henriques and Schnorr are hoping to use the design to build modular units for other families in the village. "You can buy a single unit off the shelf and as the income expands, you can buy another one, which will double or triple fuel production," said Henriques, explaining that to help with the cost, the village could become a micro-financing entity. "Purchasing is something we always advocate because of issues of ownership and care," said Henriques. "If you paid for it, you tend to value it, and because you value it, you want it to work and continue to work, and you care when it breaks."